This is a brief episode to go over the parts included in your kit. These parts will enable you to bring to life the circuits designed in Minecraft. Watch the video, Minecraft Circuits in Real Life: Episode 2: Real Life Introduction, for a more comprehensive instruction. This kit includes AA Battery Holder which holds 4 AA batteries resulting in a power source with 6V. This unit serves as your redstone providing power to your circuit. These wires will connect various elements in the circuit. It pretty much acts the same as redstone trail in minecraft. LEDs (light-emitting diodes) emits light when a current passes through it and acts very much like a redstone torch. It has two leads. The shorter lead is the cathode (-) while the longer one is the anode (+). The component allows you to make temporary circuits without soldering. You can hook wires into them and route power. Breadboards comes in many different configurations and sizes.This mini-breadboard is divided in half and the each slot within a row is connected. So all slots in Row 1 from A-E are connected. 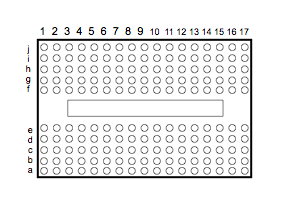 However, they are not connected to the slots in Row 1 from F-J. Also known as pushbuttons, these switches are normally open (or off). They need to be activated by pressing down on them but automatically pop back up. In this kit, we will be using assorted colored square caps with the pushbuttons. The buttons functions as two parallel wires that do not connect until the button is pressed. Then a wire makes contact between the two wires and connecting them for the moment the button is pressed down. This component is very important. It comes in many different degrees of resistance. As the name implies, it provides resistance to the current flow which is important in dealing with component that cannot handle a particular voltage. In our lessons, you will see it in action to prevent the LED from burning out due to an overload. This component serves as an electronic switch. It allows you to control the flow of the current using a smaller one simultaneously. More on this as we post our lessons that delve into logic gates. This unique chip is the culmination of various electronic components and four transistors. We will be using these in creating arrays of logic gates.